Vast is one of those games that sounds really amazing, then you pick it up and it’s really intimidating, then you play it and you just want to play it again immediately after. I don’t think I’ve ever played a game as asymmetrical as this one. I’m not sure any other games that are this asymmetrical exist. First thing that comes to mind is XCOM from Fantasy Flight, but Vast truly makes for a completely different play experience based on what role you’re playing. This is both the game’s highest crest, and its lowest valley. Let’s back up a little bit though, and talk about the game first. In Vast, you’ll take on one of 5 distinct roles – The knight, the dragon, the goblins, the thief, and the cave itself. As the Knight, it’s your job to slay the dragon. As the dragon, it’s your job to escape the cave. As the goblins, it’s your job to kill the knight. As the cave, it’s your job to collapse onto everyone inside! If you’re the thief, well, it’s your job to screw over whoever you have to in order to get treasures. Of course the cave gets to select which tiles to lay down, either helping, hindering, distracting, or simply delaying those inside. If you’re the goblins, well, watch out because you’re also food for the dragon and a means for him to become stronger. See how this goes? It goes around and around, the sheer amount of layers in Vast is astounding. The way that every mechanic seems to have this ripple effect onto the other players is one of the game’s best points. I’m not sure how much time was spent developing Vast, but the amount of legwork that went into designing this game must have been mind-boggling. The game plays in a few hours, but your first game is going to take a while. There is a full front/back rule sheet for each role, along with a slew of cardboard chits, cards, and cubes to go along with each. There is a full rulebook that is basically a copy of each of those sheets for each role, combined with rule variants, setup’s for games smaller than 5 players, and an example of play bound together as a “rulebook”. Really though, all you need is each sheet that accompanies each role and you’re set. Knight – Kill the Dragon, or smash 5 crystals and then escape the cave. You’ll be leveling up your “grit” which is like XP and grants you access to more abilities and options for your turn. Goblins – Kill the knight (or the dragon if there is no Knight), or smash 5 crystals if there is neither. You’ll spawn monsters, hide, and generally cause chaos throughout the cave. The Dragon – Wake up and escape the cave by moving from underground to the surface and then out of the dave. 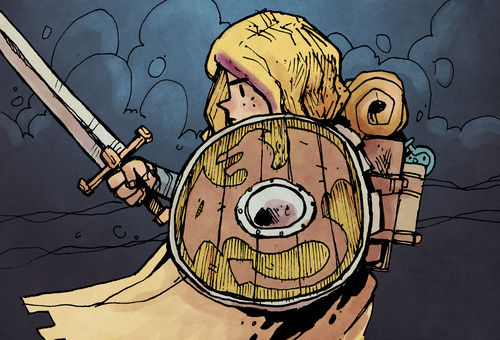 Eat goblins, hoard treasure, and leave dragon gems behind you. The Cave – Collapse by placing all of the dave tiles and then destroy them. You’ll shape the board, place treasure, and cause environmental effects throughout. The Thief – Grab and stash 6 treasures or dragon gems using a combination of stealth, thievery, and subterfuge all while upgrading your character’s abilities. Herein comes the valley that I spoke about earlier, the learning curve on the game can feel very isolated. As you begin to figure out how to play your role, the other roles don’t necessarily come into focus until you play them yourself. That means that you’ll usually find players playing the same role each game because they already know how to play it and don’t want to bother taking the time to learn something new. Perhaps this was just my group, but I can’t imagine it being isolated to just my lazy cohorts. That being said, approach the game knowing this and if it’s right for your group. Vast a deep, layered game full of surprises and emerging mechanics, each time you play you’ll feel like there is some new nuance you picked up on, or some new angle to work when trying to reach your victory condition. Also, the production values of Vast are phenomenal, although my copy had misprinted crystal tiles that weren’t the size of all of the other cave tiles it is still a very well put together product. The artwork is fantastic and really captures the fun but not-too-serious nature of the game. 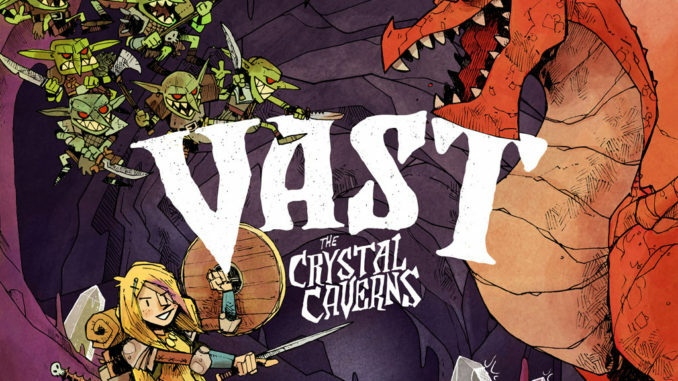 Vast has just wrapped up a second Kickstarter for a second printing of the game that includes brand new roles, miniatures, and more to add to the game. It’s a shame I didn’t get this review up in time before it finished, but hopefully you’ll be able to snag a copy of Vast in the near future. If you’re looking to buy in a more conventional method, Amazon says you might be waiting until February. It will be well worth the wait though.